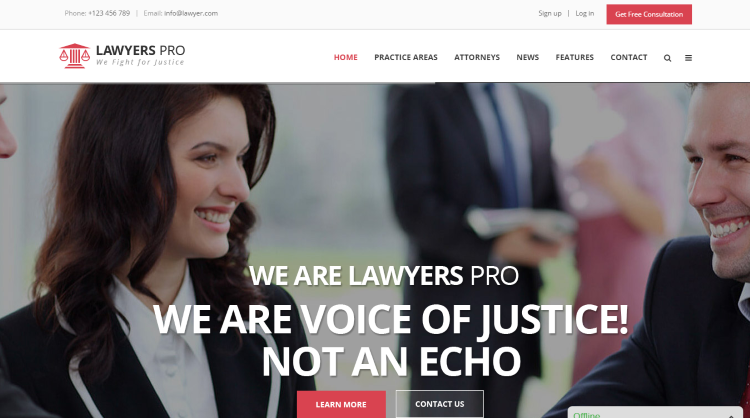 Here are 15 great lawyer WordPress themes designed for attorneys and law professionals. 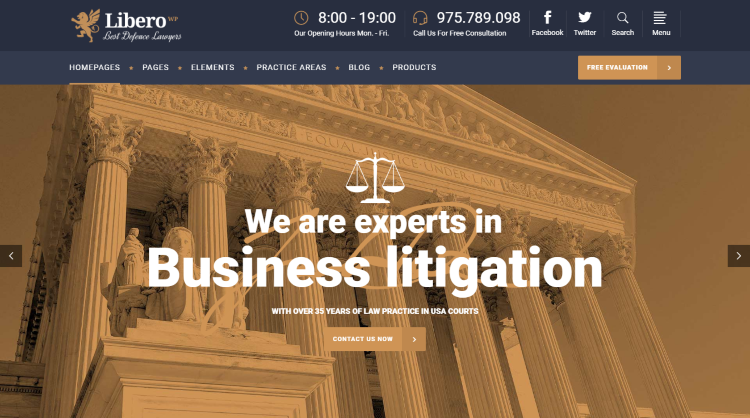 LawBusiness is the best selling lawyer WordPress theme on Themeforest and is perfect for attorneys and law firms. The entire theme looks very professional with a white, black and red color scheme. There are 2 types of custom posts available – Services and Testimonials. With custom posts, you can create pages on your website highlighting your services, clients, and testimonials. This will make your offering clearer to your prospective clients and help you to close more business. LawBusiness includes the Visual Composer premium plugin. With the help of this plugin, you can create content easily using its drag & drop mechanism even without the help of a developer. The theme also includes 23 custom made shortcodes which will help you to create content more easily. 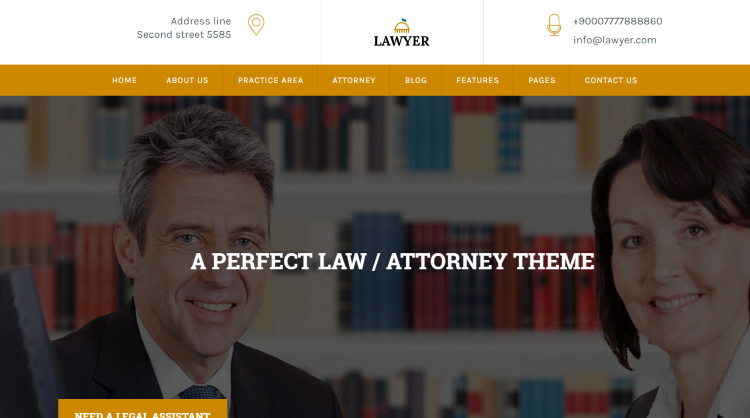 The Lawyer & Attorney theme is another fantastic theme designed for legal professionals. The theme looks absolutely stunning and gives a great first impression. This theme can be customized based on your needs. You can choose from 10 different header styles, 20 different footer layouts , 4 color schemes and over 600 different fonts. To showcase your legal expertise, the theme offers pre-built pages like Opening hours, Free consultation forms, Practice areas, Case results, Q&A and Team members. All these factors are important from a client’s perspective. By highlighting each of these separately, you can generate trust in your client’s mind. Lawyer and Attorney theme comes bundled with some premium products. You get slider revolution, 1200 premium icons, and in-depth video tutorials absolutely free. The unique thing about Themis theme is that it’s quite simple compared to other themes without compromising on functionality. The home page layout gets straight to the point instead of showcasing a lot of irrelevant things. This theme is completely responsive and works great on all devices. It is suitable for attorneys, lawyers, law firms, judges and other legal professionals. The theme also features 80 custom designed icons, 30 custom shortcodes, and 20 different page layouts. The colors of the theme can be changed to match your brand. You also have 800 different fonts to choose from. 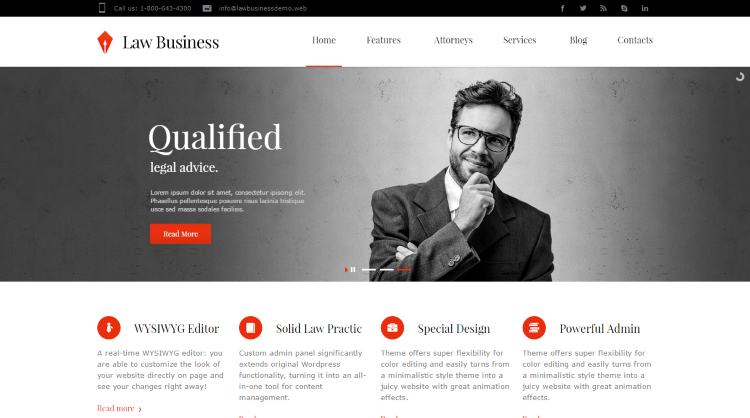 Lawyer Base is a lawyer WordPress theme that features a clean and responsive design with excellent visuals. The theme is made with white and red colors which look absolutely professional. Lawyer Base offers a moderate amount of features if compared to other themes, but the included features are extensive and offer a lot of breadth. You can use these features and tailor the theme exactly to your needs. For example, when you create a page to highlight all the individual lawyers on your team, there are 4 ways using which you can showcase them on your website. To showcase your practice areas, you have 15 different layouts to choose from. Apart from these features, the theme comes with their drag and drop page builder which helps you to design new pages and edit existing pages with ease. You also get a free copy of Master Slider premium plugin which you can use on your homepage. 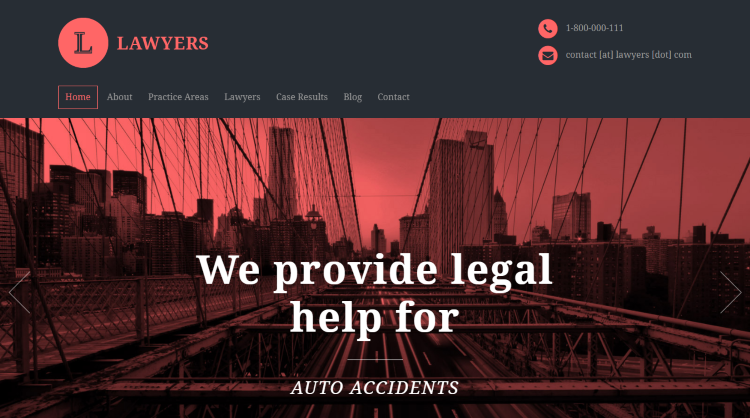 Lawyers is an SEO optimized WordPress theme and can be used by law firms, legal offices, legal advisers, advocates and other legal professionals. The unique thing about the theme is that the home page is completely made of widgets. You can easily add or remove widgets to customize your home page. 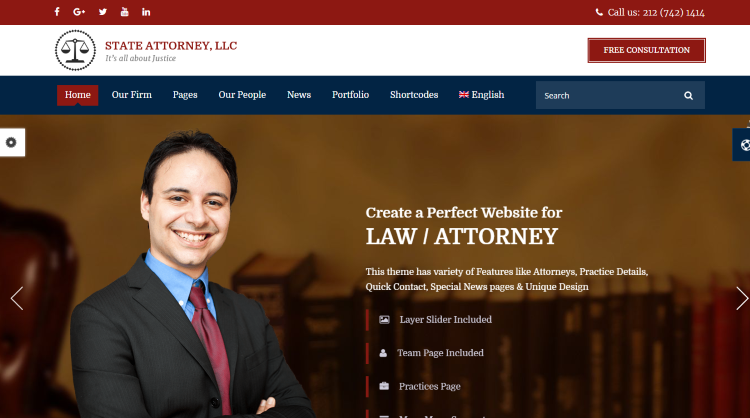 Lawyers theme has a lot of law specific features. It allows you to showcase practice areas, case studies, and even individual team members. You can use these pages to get more business. The theme admin panel allows you to change the colors and other features of the theme. The theme also supports WPML – so you can translate the theme in the language of your choice. 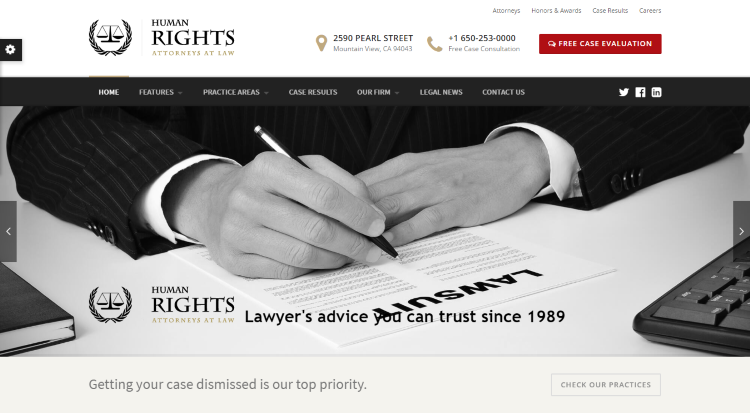 Human Rights is a great theme that features a modern look with a responsive design. The default color scheme gives a very professional look with a minimal design. The colors of the theme can be customized from within the admin panel to make the theme align with your brand. The theme also offers customization on every aspect. To create new content and edit the layout of the existing pages, you can use the bundled Visual Composer plugin. You can also use Revolution Slider to highlight different services and practices that you and your firm handle. The Law is a versatile theme that can be used by law professionals. The theme is extremely powerful and responsive. The strength of the theme is in its customization abilities. Here are some of the features about this theme worth noting – 12 header styles, 7 different sliders, translation ready, unlimited color variations, 350+ configurable options, multiple custom widgets, 100+ shortcodes, 350+ icons, 21 page templates, 4 custom posts, 50 patterned backgrounds, and much more. With such customization abilities, you can create the perfect layout for your business needs. Not only that, you also get two premium plugins (Visual Composer and Slider Revolution) completely free. That’s a saving of 53 USD. 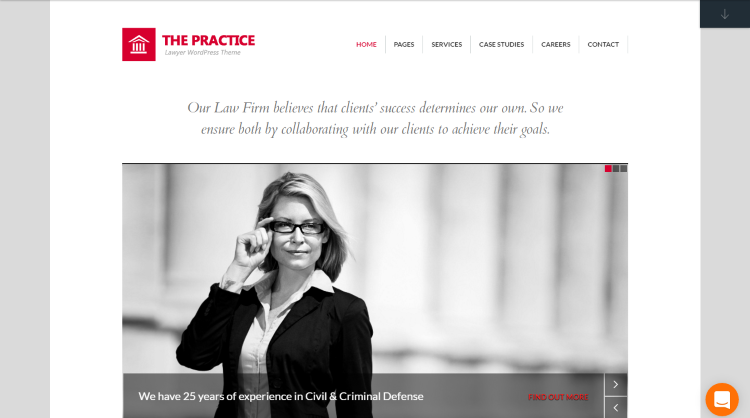 The Practice is a responsive and retina-ready lawyer WordPress theme. It is enhanced with great features that make it one of the most compelling choices. The best features of this theme are customizable colors, multiple header layouts, multiple footer layouts, custom pages to highlight your team or services, and a complete drag and drop visual editor. The Practice theme also includes an events page which you can use to highlight important dates on your website. This theme also has the option to use the built-in mega menu. You can also start a forum and provide legal advice using the theme itself. The theme supports bbPress and BuddyPress which you can use to achieve exactly that. 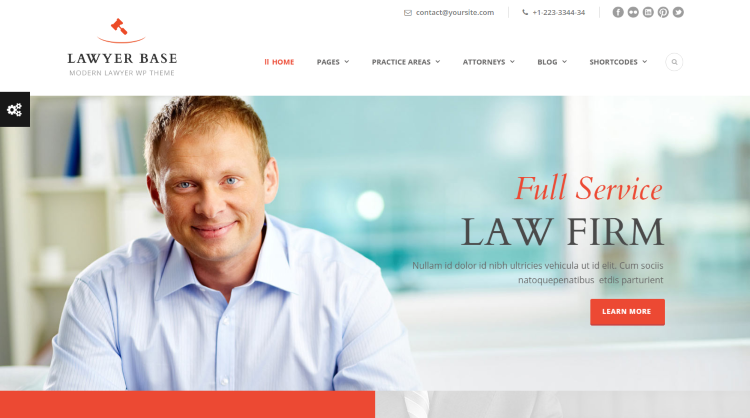 Law office is a mobile friendly theme and has powerful configuration options. The theme supports WooCommerce, Visual Composer and WPML for multi-language support. Unlike most themes, Law Office theme supports swipe controls on mobile phones. The theme also supports multiple header options. You can also use the built-in sliders to showcase case studies, client testimonials, services, or even your team. This theme comes with the WP Booking Calendar plugin. You can use this plugin to allow your website visitors to fix appointments with you without any human intervention. 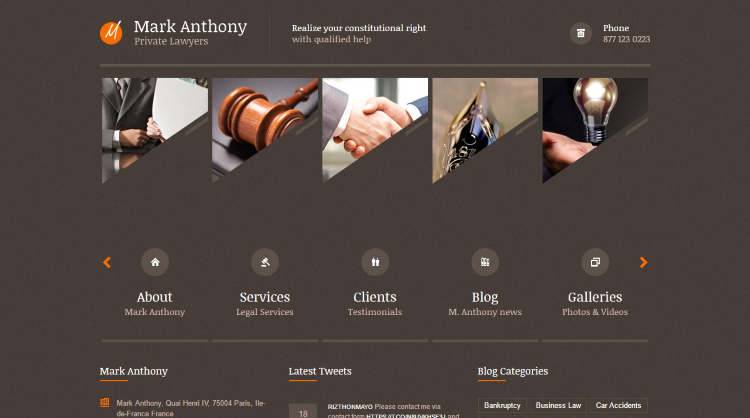 Another great looking and feature rich theme for lawyers and law professionals is Law Practice. The theme uses a purpose oriented design and comes with multiple options to provide insight into your law business to your potential customers. You can customize the colors from the theme options page. You can also edit the home page layout easily with the built-in drag and drop page builder. This theme allows law professionals to highlight their services with 3 unique features: Case Study Management, Practice Management, and Team Management. 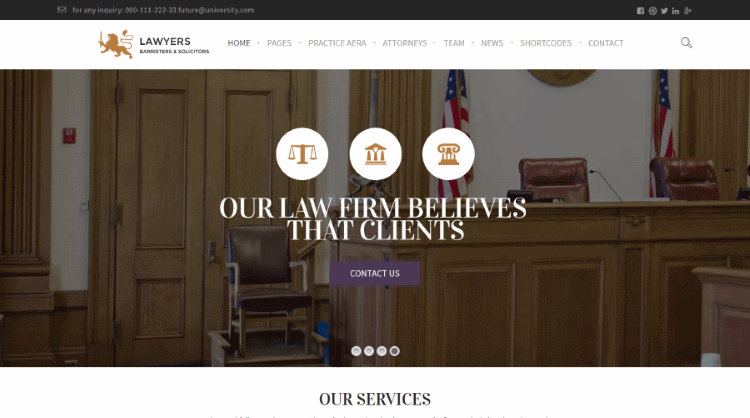 A Lawyer is a fully responsive, SEO optimized and cross browser compatible WordPress theme. It is loaded with all the features suitable for any law related website. 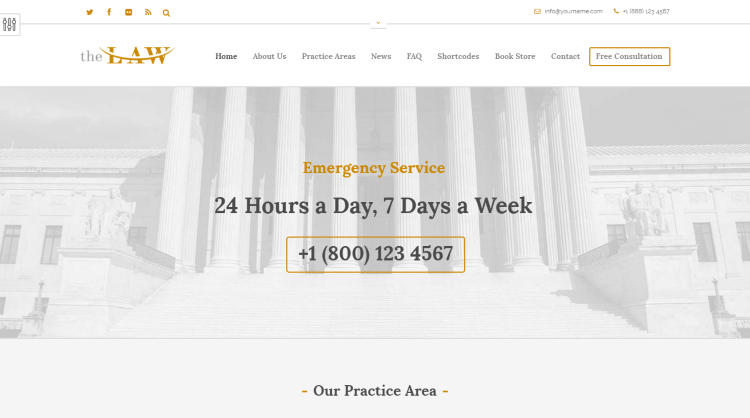 It includes 3 homepage variations, two attorneys page layouts, and two practice-area layouts. This retina ready theme comes bundled with Visual Composer and Revolution Slider premium plugins. Lawyer Pro is a Twitter Bootstrap 3.0 based WordPress theme and has been developed by CrunchPress. It is suitable for lawyers, Attorneys, Law firms, and even Corporate sites. It is loaded with all the required features like Attorney Profiles, Practice Areas, Consultation & Booking forms, Event Management, Testimonials and Honor & Awards. Not only that, you can easily set up your website using its one-click demo importer feature. 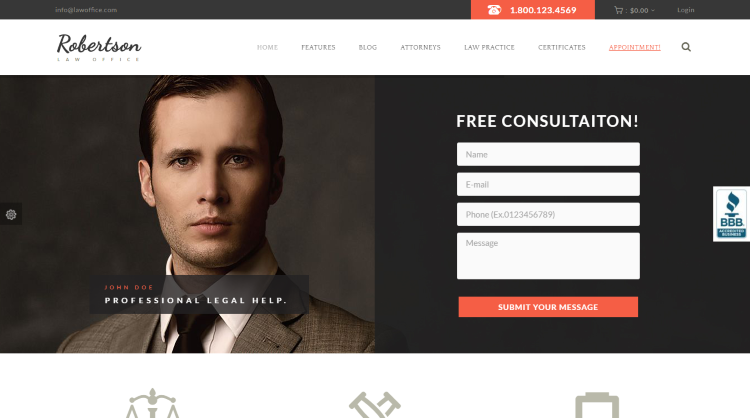 Attorney & Lawyer is a clean and responsive lawyer WordPress theme. It is a retina-ready, RTL supported, and WPML compatible theme. This theme has been built using HTML5 and CSS3. You can use the Fixing Appointments widget on your website so that your clients can fix appointments as per their suitability. This theme also comes loaded with 20 shortcodes, 10 unique page layouts, awesome page builder, Events Calendar plugin, mega menu, and more. 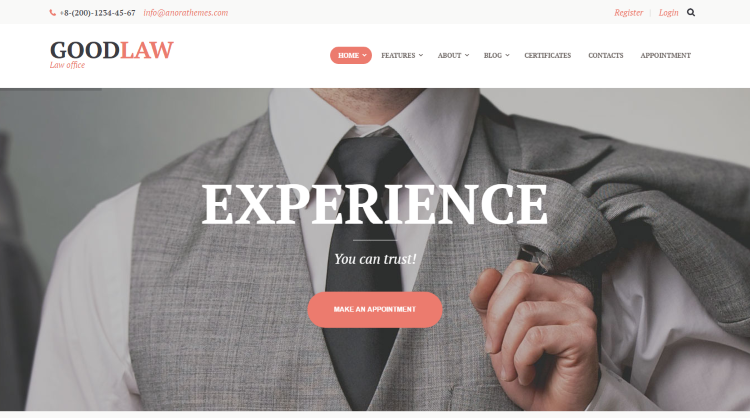 If you are looking for a minimalistic, SEO optimized, and responsive lawyer WordPress theme, then GoodLaw is the best fit. This theme can also be used for other business websites. It is a powerful theme with lots of features. Some of them are easy navigation, awesome blog layouts, useful shortcodes, page builder and more. It also includes WP Booking Calendar plugin for making appointments. Libero is a fully responsive theme and has been developed by Mikado Themes. It comes with a powerful theme options page using which you can customize your website as per your requirements. This theme includes premium plugins like Visual Composer and Revolution Slider. You can create stunning pages using these plugins. Libero also comes loaded with shortcodes like Video Box, Interactive banner, Image Slider & Image Gallery, and more to make life easy for you. 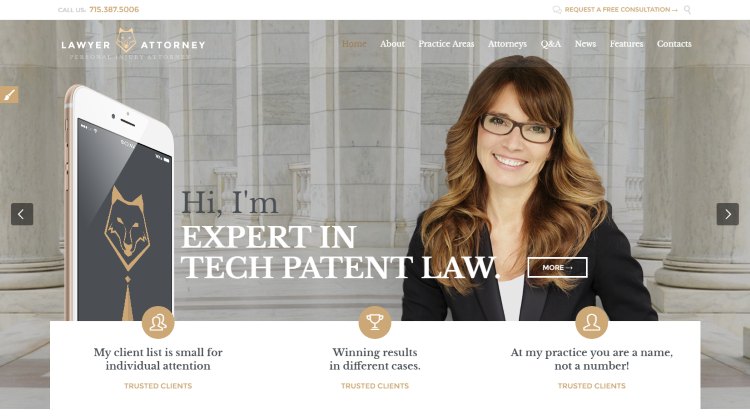 This article contains some of the best lawyer WordPress themes from Themeforest. Choose the one which is perfect for your business and start your website today!